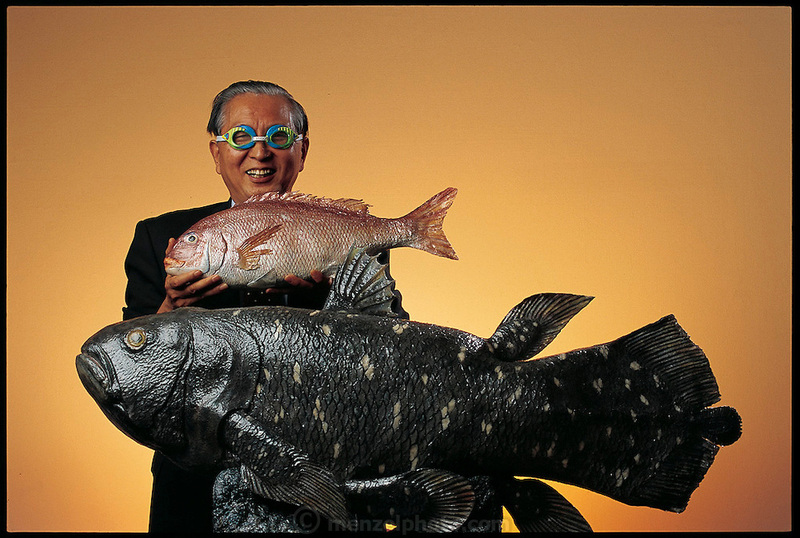 Good-naturedly donning fishy swim goggles for the camera, Yuuzi Terada, an engineer at Mitsubishi Heavy Industries, stands at company headquarters with a pair of the sleek robot fish he constructs. Gray's Paradox asks the question why fish, with their slim muscles and small fins, can accelerate so quickly. Researchers have long hoped that unraveling Gray's Paradox will allow them to build safer, faster nautical propulsion systems. The dream is shared by Terada and other researchers at Mitsubishi, who have long thought that fish fins might serve as a model for a new kind of propeller that would make underwater vehicles faster, more stable, and more maneuverable. Japan. From the book Robo sapiens: Evolution of a New Species, page 106-107.